Day 1 - Welcome to the Mother City. Accommodation: 12 Apostles hotel and spa, Cape Town. 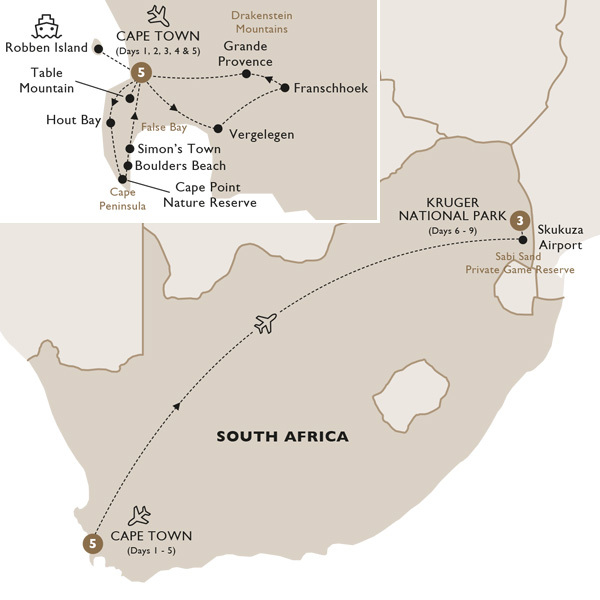 Day 2 - Cape Peninsula and Lunch in Cape Point. Day 3 - Majestic Table Mountain. Day 4 - Historic Cape Winelands. Day 5 - Amy Foundation and Robben Island. Day 6 - Luxury Safari Experience. Accommodation: Lion Sands Narina Lodge/Lion Sands Tinga Lodge, Kruger National Park. Day 7 - Looking for the Big Five. Day 8 - We're going on a Safari. Day 9 - Farewell South Africa.